Discussion in '1940' started by Drew5233, Aug 24, 2018. 'We tacked ourselves onto the rear of the smallest of the three queues, the head of it was already standing in water up to the waist. Half an hour passed. Suddenly a small rowing boat appeared. The head of the queue clambered in and were rowed away into the blackness. We moved forward, and the water rose to our waists. Our only thoughts now were to get to a boat. Along the entire queue not a word was spoken. The men just stood there silently staring into the darkness, praying that a boat would appear and fearing that it would not. Heads and shoulders only showing above the water. Fixed, Immovable, as though chained there.. It was, in fact, practically impossible to move, even from one foot to another. The dead weight of waterlogged boots and sodden clothes pinned one down. My breeches seemed to be ballooned out with water as heavy as mercury. I was filled with a dread that when the time did come I should be unable to move. Every now and then as we stood there rooted in the sea, a slight swell stirred the surface and the water rose to my chest, and up to the necks of the shorter men. We thanked heaven the night was calm. Had there been a strong breeze blowing the swell would have swamped us and, I suppose, many of us would have been drowned, for we were too exhausted to make a struggle against a heavy sea. We glued our eyes in the direction of whence was to come our salvation. Another lifeboat appeared but it halted at the end of the queue on our right. Enviously we watched as it filled up. 'Not too many on one side or you'll have her over,' came the cry. Off went the boat, and again we resumed our vigil. Minutes became hours; and hours an eternity. After a long while we were attacked by a horrible dread that there would not be any more boats. That we should stand there half submerged in water throughout the night, and then, after all, have to spend the day on the beach. A leaden depression seized us, and our hearts became as heavy as our water-logged bodies. The weariness of the wait was appalling. Try as we could we found it impossible to keep our eyes open. Half of us were asleep standing up. And everyone of us kept waking with a start out of the sort of coma that descended on us. During all this time the German shells continued rain upon the town . Stray hot splinters flew round our heads, hissing as they fell into the water. Still Dunkirk showed its long flaming front behind us. The red glare in the sky extended over us. 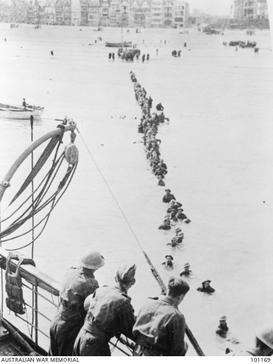 Along the Mole, a quarter of a mile to our left crept the tiny figures of the soldiers being evacuated by the ships. Little black figures, silhouetted against red fire. Captain Austin was eventually rescued from the beach and brought back to England onboard the Medway Queen landing in either Ramsgate or Margate on one of her seven crossings between 28th May to 4th June. Image of the Medway Queen below. Jonathan Ball, Koen, timuk and 5 others like this.